A glass bowl is a shade that goes onto the light kit. Many of the Harbor Breeze glass bowls that are available are ornate in nature and quite lovely. Some of the glass bowls from Harbor Breeze are reviewed and discussed in more detail below. A glass bowl is much like a glass shade. It can be easily dropped and smashed upon the floor. This happens to many people because they attempt to change the shade or bowl on their own. It’s much more effective to do this with a partner, spouse or friend helping you. Why? Because at some point, you’re going ot need four hands – two to hold the bowl in place, and two to secure the bowl to the fan. Same rule applies when you need to unfasten the bowl – you’ll need someone to hold onto it while you do this. Unless of course you’re a superhero, with super fast cat like reflexes. We don’t suggest leaving it to chance – keep in mind when that bowl is unfastened, it’s going to drop! This is what a broken bowl or lamp shade looks like – notice how the pieces have splintered off, making it more difficult to repair the shade. A frosted glass bowl is glass the has a frosty finish. Frosted Glass Bowls are often a popular design, and quite common in the marketplace today. 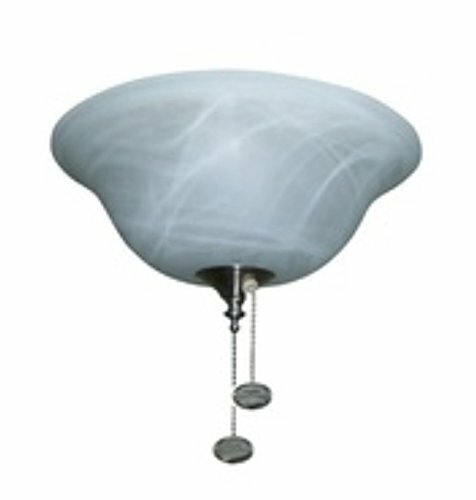 Many lamp shade manufacturers produce frosted glass lamp shades. It’s typically not too expensive to manufacture or purchase. Frosted Glass has its benefits – its more of a tapered glass, so if it smashes or breaks there is that chance it may not crack into as many small pieces. If you have a frosted glass bowl smash on you, take a look and see if it’s in just a few pieces, or many. If there is just some cracks and the breaks are not many, you may be able to glue it back together with superglue or other strong adhesives. However, if the bowl has broken into many small pieces this will be not advisable or doable. A mosaic glass bowl is much like stained glass. There is a pattern or design which essentially becomes part of the bowl. Mosaic glass is interesting, in that each piece continues the design. Mosaic glass will break easier than other forms of glass. It is often thinner than frosted glass and more likely to chip, fade or become damaged. Because of the design which is built into the mosaic glass, much like Tiffany stained glass, a break can be much more difficult to repair with glue or other adhesives. Mosaic glass bowls can be heavier than frosted glass as well. It’s advisable to have help when you mount or unmount these glass bowls to the ceiling.